Want to be “Simply Happy?” Start by reading this book. 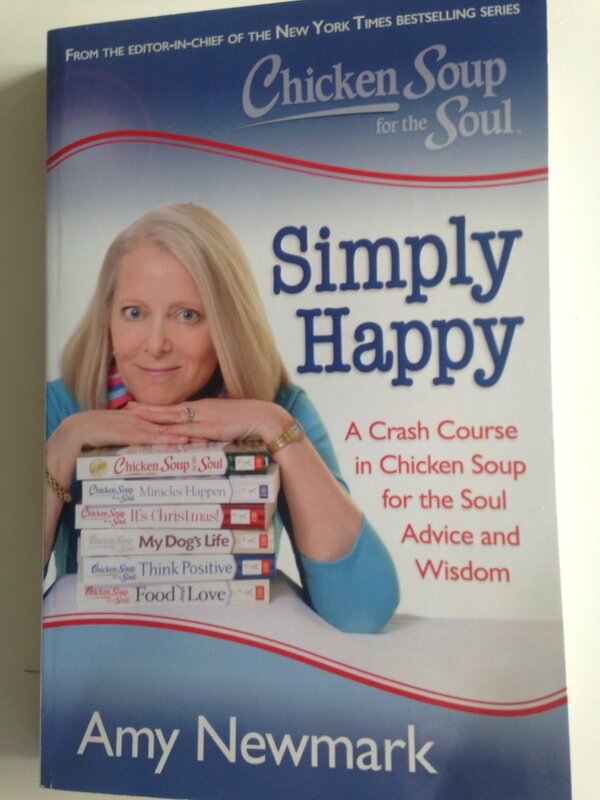 From the editor-in-chief of the Chicken Soup for the Soul series comes a first book called Simply Happy. It’s out tomorrow, but I was blessed with a splendid sneak peek of Amy Newmark’s debut book. For those of you who have ever worked with your spouse (and I have! ), you’ll be tickled by Amy and her husband’s “Declare Voldemort” time periods. Since she and Bill work together, sometimes they need a break. When one of them says “Voldemort” (from the Harry Potter series, Lord Voldemort is he-who-must-not-be-named) neither of them is allowed to discuss or text one another about Chicken Soup or their other businesses. They may email one another and if it’s a weekend, the spouse has the right not to answer until Monday if they so choose. This tells me that Amy not only advocates keeping life in perspective and balance, but that she lives the lifestyle as best she can. Spoiler alert: a story of mine is mentioned on page 88, one that makes me gulp even as I read about it. That would be the one where I was being a spoiled princess, thinking more about myself than my marriage. A dream (mostly) snapped me out of it. While I’m not perfect, the wonderful weekend I just had with my husband reminds me how that dream changed everything. I’m proud, thrilled, to have my story mentioned in Amy’s book. And even prouder because Amy points out that my name is pronounced “Dream-uh,” and my story was about a dream. My father, who we lost nearly two years ago, named me, so I love my name. Amy’s book is full of stories and experiences she’s had editing these books and how they have not only changed others, but her as well. Some stories have lingered with her for years. Then there are tips in the book such as paying attention to the time we have been squandering. “If you regain only two percent of the minutes in your day by being mindful and not wasting them, you’ll actually get back half an hour a day,” she says. That’s time that could be used to write or work towards a goal you “never” have the time for. This crash course in advice and wisdom can be taken one chapter at a time, or devoured (my style) in one sitting. Whatever your style, I recommend this sanity-saving read. Let’s hope this is only the first of many quick-tip-with-meat-included books by the bubbly and savvy Amy Newmark.